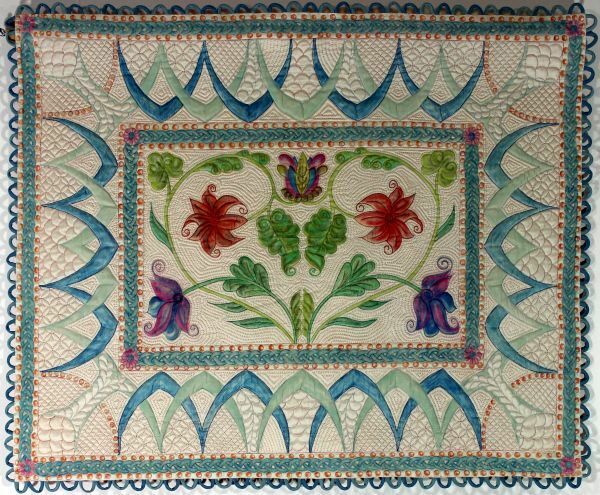 A photo of an early 18th-century quilted pillow sham inspired this small wallhanging. The border quilting pattern is very similar to those seen on Welsh quilts. It is made of silk dupion and colored with wax crayons. Further color has been added with a variety of thicknesses of embroidery threads with backstitch quilting as well as running stitches for the background. The edge is finished with rouleaux.